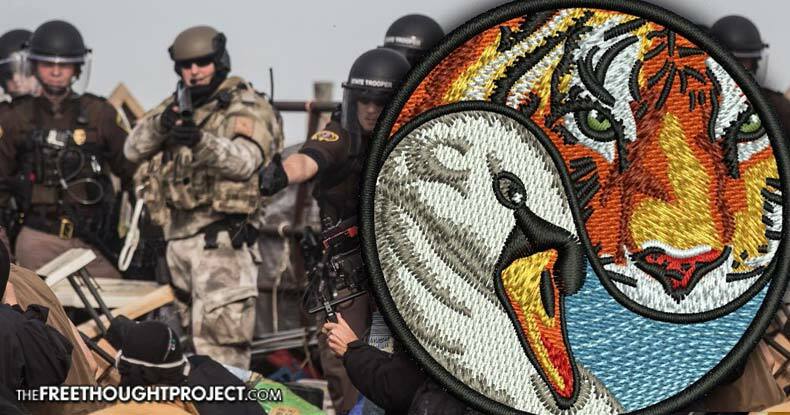 In an interview with Democracy Now, award-winning national security journalist Jeremy Scahill revealed stunning connections between a private security firm called TigerSwan, operated by a former Delta Force operative, and law enforcement intelligence operations at Standing Rock. Co-founder of the Intercept, Scahill, has spent years reporting on private security contractors such as the private security firm TigerSwan. In these most recent revelations, Scahill exposes how TigerSwan has links to the now-defunct mercenary firm Blackwater and is in charge of coordinating intelligence for the Dakota Access pipeline company. As the interview was wrapping up, Democracy Now host Juan Gonzalez questioned Scahill as to whether he had found any connections between the Morton County Sheriff’s Office and private security firms. “Well, the Morton County sheriffs, they released documents, internal documents, about their investigation into the dog handlers. And what they inadvertently revealed was that this company, TigerSwan, run by these Delta Force guys, was actually in charge of coordinating the intelligence operations against the protesters. The reality that tech originally developed for military use in hunting global terror suspects is now being used against peaceful protestors here in the United States should send a shiver down your spine. The fact that this technology is being used in Standing Rock reveals the truly insidious nature of a creeping police state that combines weapons of war with domestic policing to the detriment of free expression and dissent. It is important to note that private security forces are not necessarily the problem as they are far easier to hold accountable than government agencies like police. However, what Scahill describes in the situation above is anything but private. It is a non-governmental agency melding forces with government — the de facto definition of corporatism.